Anyway, this recipe has nothing to do with shell creatures ; it is made with scrod and curry powder (I know, the title says it all, please forgive your aging neighbor!). Up until recently I couldn’t use curry powder in my recipes because of the cinnamon in it. Somehow it doesn’t agree with my husband. So I was really excited the day I found one that didn’t contain cinnamon ! All this time spent reading labels has finally paid off ! All these recipes I’ll be able to make now… Ok, let’s not get curried away – bad pun, I know, but I couldn’t resist it. Bottom line : if you have had problems with curry powder, don’t despair, dear neighbor, there has to be one out there tailored to your needs. This dish is great for a meal with guests : you can make it ahead and warm up the fish at your convenience, or follow steps 1 through 4 and keep the baking for when your guests arrive. Finally, one last note for Jack and other nightshade intolerant people : I am pretty confident that you can substitute pureed squash for the tomato paste, as I have done it before in a winter chili recipe. I know this is not the season for squash any more (or yet!) but maybe you have some in your freezer ? – 1 TBSP tomato paste (made from nothing but tomato and salt), preferably organic; in the States it is only available in cans but you don’t have to feel like you are going to waste what you didn’t use: just freeze tablespoons inside small plastic bags. – 1 TBSP full fat coconut milk, and again here, frozen is an option ! Whenever I have leftover coconut milk from a container I pour it into an ice cube tray then transfer to a plastic freezer bag when set. 1. Steam or cook the peas in salted boiling water. Cooking time varies a great deal, depending on size, freshness and also variety! 2. Preheat oven to 185°C / 365°F, (fan-forced) or 200°C / 390°F, if not fan-forced. Combine tomato paste, coconut milk, salt and water. 3. Season fish with curry powder and quickly pan-fry all sides in hot olive oil. Do not cook thoroughly : this will be done in the oven. 4. Place fried fish pieces in a baking dish. Put tomato-coconut-water liquid into the warm frying pan and scrape with a wooden spatula before pouring out onto the fish. This will ensure that no curry will be left behind. 5. Cover with aluminum foil or grease-proof paper and bake for 20 to 30 minutes. 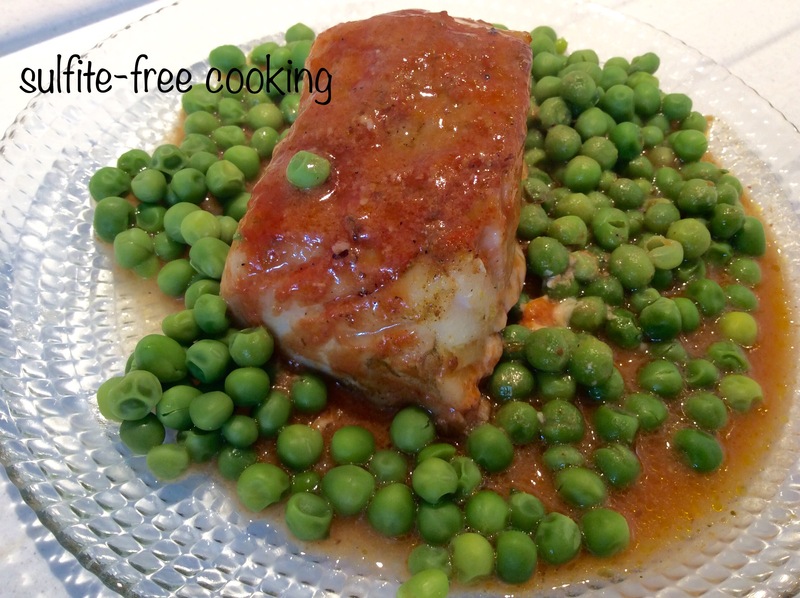 Serve with peas and steamed rice or millet. Oh yum, this looks delicious 🙂 I hope you had a wonderful holiday! Thank you! It was a nice break fully shared with my husband, for once: he didn’t take any work with him!